Growing up, the making of the “gravy” was a big production. Actually, it still is, but once your kitchen fills with the heady aroma of fresh herbs and garlic, you realize it’s worth all the effort. 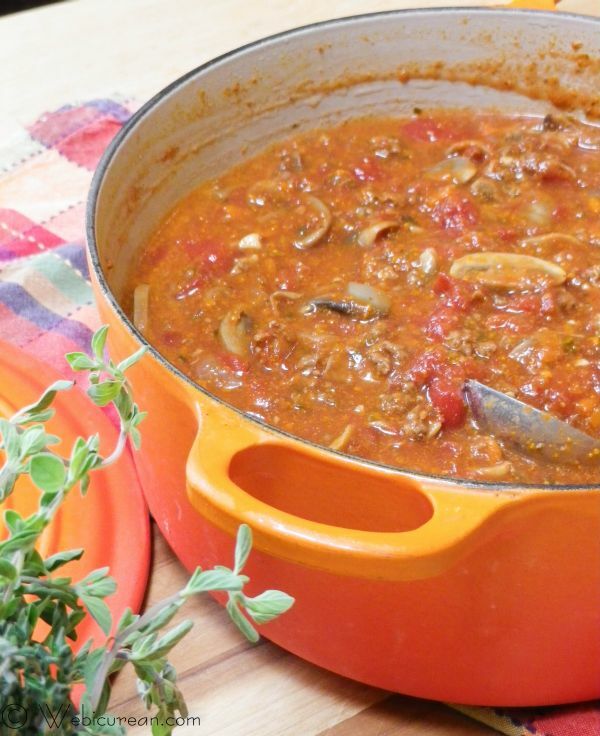 A simmering pot of meaty-tomatoey-herby deliciousness promises of good things to come. 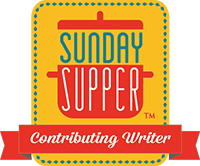 My mom would start her day early, and we would eagerly await a grand supper. Would it be ravioli? Spaghetti dotted with meatballs? Stuff-A-Roni? The possibilities were endless. Apparently, there is some debate as to whether this is sauce or gravy. Technically, it is sauce, but many Italian-Americans know it as gravy. Funny enough, the East Coast lays claim to the term “gravy.” But here on the Left Coast, those of us descending from folks who arrived from the lapping shores of the Mediterranean Sea know it as gravy too. At least in our family. Some of the confusion may lie in the translation from the Italian word “sugo” which is used to describe a meat sauce, but the literal translation in English is “gravy.”Â My copy of La Cuciniera Genovese (1863) has a recipe for “sugo di carne a stufato” — a sauce made of meat, garlic, rosemary, white wine, and of course tomatoes, cooked in a long simmer, which is basically what we’re doing here today. Whether you call it sauce or gravy makes no difference, really. What’s important is that you enjoy the ritual of preparing it and share the results with family and friends. 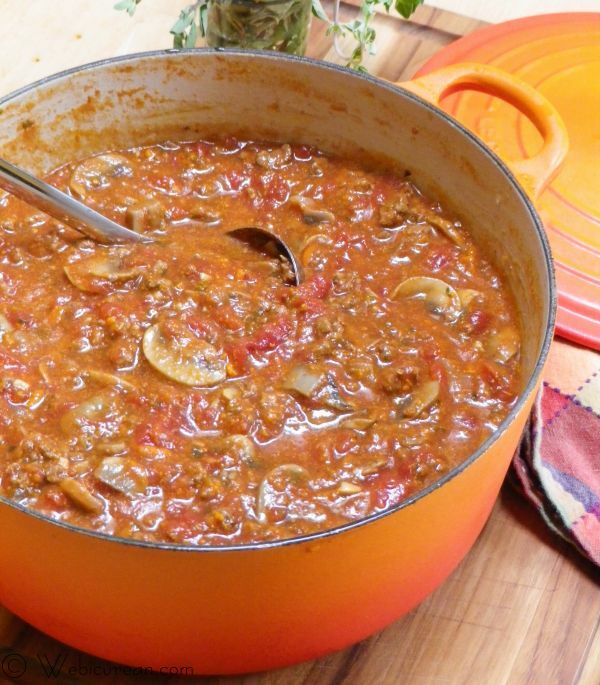 This recipe makes a big pot of sauce(! ), and it freezes well. So enjoy some the day of, then save the rest for later use. It only gets better with age. Oh, and don’t forget to check back on Sunday for some Stuff-A-Roni to go with it. Before I start the cooking, I like to get all of the chopping, slicing and dicing out of the way. 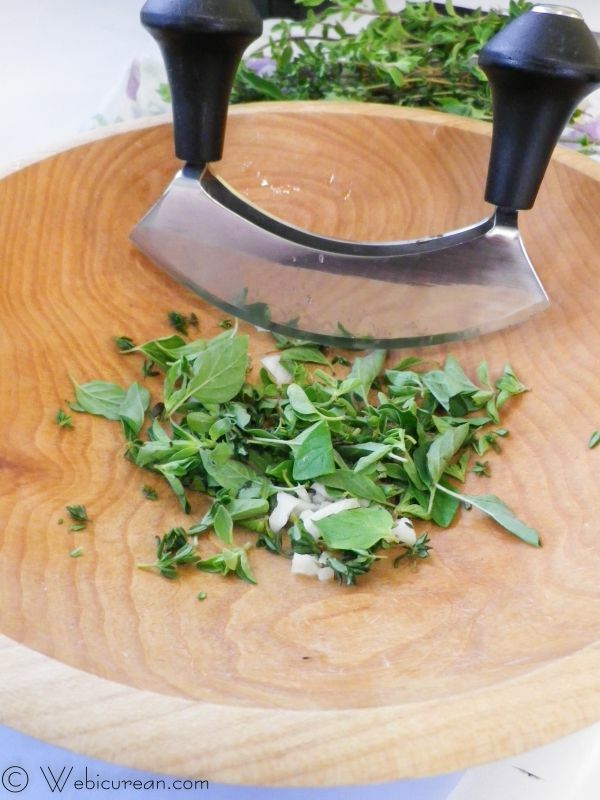 For the herbs and garlic, my trusty chopping bowl and mezzaluna are the tools of choice. You can also give this a quick pulse in a food processor if that’s what you prefer. First, brown the onions in the olive oil over medium heat. Then the herb and garlic mixture goes in for a quick stir. Then add the meat and sausage, breaking it up as it cooks. 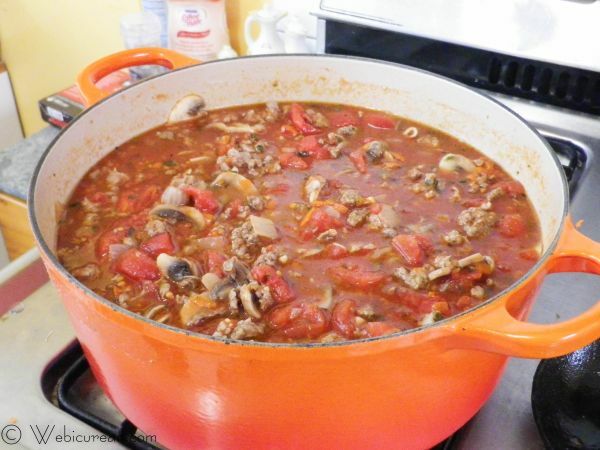 Once it starts to brown, add the carrot and mushrooms, cooking until the mushrooms soften.Â Add salt and pepper to taste. Italian cooking is a messy deal. Crush the tomatoes with your hands, and add them to the pot, juice and all. Add all the other tomatoey stuff along with the white wine, and stir until the tomato paste is fully dissolved. Bring this to a boil, then simmer covered for about an hour.Â After the first hour, taste to see whether it needs any salt. Also, if it’s too acidic, stir in a little sugar (the carrot should add enough sweetness, but you never know with canned tomatoes).Â Cover and continue to simmer for another hour. Use this to top your favorite pasta. Make it the base for a yummy lasagna. Heck, just grab some french bread and dig right in! This traditional Italian gravy loaded with fresh herbs, garlic, meats and tomatoes is the perfect topping to any pasta dish. Heat the olive oil in a large pot over medium heat, and add the onion, sauteing until it starts to brown. 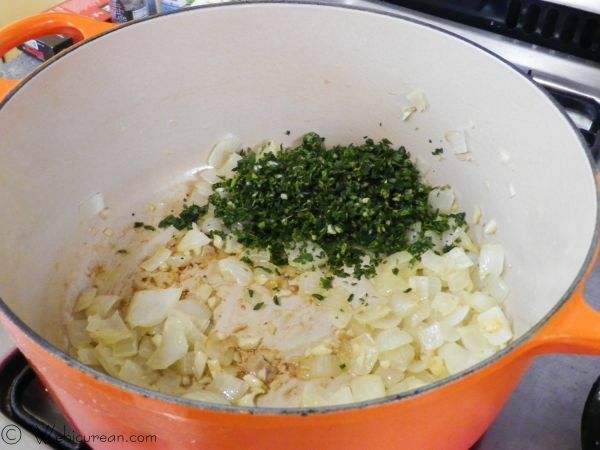 Stir in the garlic and herbs, cooking for just a few minutes. 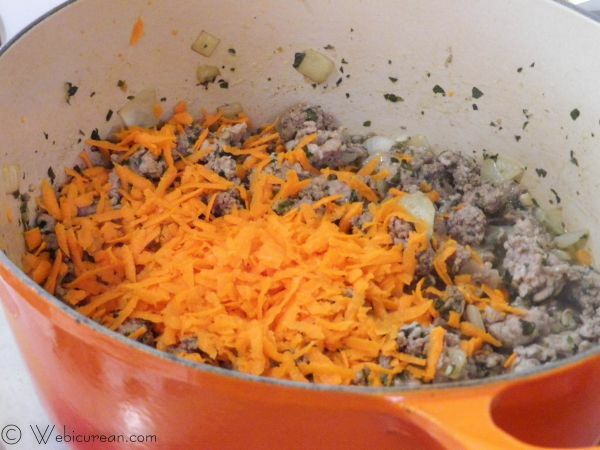 Next add the ground beef and sausage, breaking it up good as it cooks. Once it starts to brown, add the carrot and mushrooms. Continue cooking until the mushrooms are tender. Salt and pepper the mixture. Crush the tomatoes with your hands, and add to the meat mixture, juice and all. Stir in the additional can of crushed tomatoes, along with the tomato paste and white wine, stirring well to incorporate the tomato paste. Bring to a boil, then reduce heat and simmer covered for about an hour. At this point, taste the gravy to see whether it needs any additional salt. Also, while the carrot is intended to replace sugar, if the gravy is still too acidic, try adding a little sugar (a teaspoon at a time) until the flavors are balanced. Cover and simmer for an additional hour. What is it about blustery days that makes stuff like this extra good?! I tried this recipe and my husband loved it! He doesn’t even like Spaghetti or Lasagna usually! I loved it to and am going to make a double batch today to share with a friend. Thanks for the recipe! So glad you enjoyed it–thanks for letting me know! I especially love to make lasagna with it! Out ofcuriousity can you leave the wine out? Hi Liz–yes! You can substitute some broth or even water just so that it doesn’t get too thick. Enjoy!